Mr. Oliver was born in San Augustine, Texas. He was a graduate of the New Mexico Military Institute and attended the University of Texas at Austin. He became a union organizer for oil workers in Texas in the late 1920s and stayed active in the labor movement for the next three decades. In 1942, he came to Washington as a representative of the Textile Workers Union of the Congress of Industrial Organizations. In 1943 and 1944, he was director of the Southern Cotton Textile Division of the textile union. Mr. Oliver then joined the Army and served in Europe. He was awarded the Bronze Star. After the war, he was director of organizing for the CIO in Texas for five years. He returned to Washington in 1950 after he was named economic and labor adviser to the Marshall Plan by President Harry S. Truman. He was an adviser to the Mutual Security Agency, which became the Agency for International Development, and was one of the founders of the International Labor Organization. He also was one of the founders of Cornell University's School of Industrial and Labor Relations. In 1952, Mr. Oliver became executive assistant to Walter Reuther, president of the CIO, and ran the union umbrella group's national office. He helped to negotiate the merger of the CIO with the American Federation of Labor and then became legislative co-director of the newly formed AFL-CIO. In 1958, he founded Robert Oliver & Associates, a public relations and lobbying firm. Its clients included the AFL-CIO's Industrial Union Department, Sperry & Hutchinson Co. and General Foods. 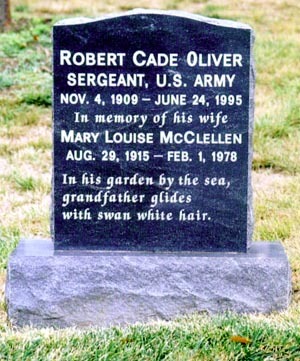 He retired in 1979 and moved to Southern Shores, N.C.
Oliver's wife of 45 years, Mary Louise McClellan Oliver, died in 1979. Survivors include four children, Roberta Teel Oliver of Washington, Robert Spencer Oliver of Copenhagen and Washington, and Garrett McClellan Oliver and Bruce Lee Oliver, both of Nags Head, N.C.; six grandchildren; and two great-grandchildren." In November 1997 it was reported that he was buried in Arlington National Cemetery under the provisions of a waiver to the burial requirements. This in spite of the fact that holders of the Bronze Star Medal are qualified for Arlington burial. The waiver was supported and proposed by Senators Tom Daschle (D-S.D.) and Bennett, former Senator Sam Nunn (D-Ga.) and Representatives Hoyer and Lane Evans (D-Ill.): Deceased was Robert Oliver, wounded at the Battle of Bulge, never applied for Purple Heart.